MABOS® is an extremely innovative magnetic flooring system. It is flexible and quick to install without any adhesive, resulting with a floor that is beautiful and elegant. No glue, no click system. Just simple lay down! MABOS®, magnetic flooring system is composed of two elements: a metal foil that is laid directly on the subfloor, and a pvc floor (strips or tiles), with a magnetic underside. Once laid, the pvc will adhere to the foil, creating a single body. Simple to install, MABOS®, enables quick and economical style changes and is therefore ideal for all areas where quick installation is needed. It can be laid on existing hard flooring and can be walked on immediately. It’s durability is perfect for high traffic application – as hotels, airports, exhibition stands, shops, fitness centres, offices, shopping centres, hospitals and medical studios – as well as residential uses. The vast collection allows you to quickly renew your flooring with a new elegance to the space, choosing your own style within a wide range of designs. Its natural look, combined with its practicality, quality, and durability put MABOS® ahead of its competitors. MABOS® is made of 100% pure, non-recycled PVC and is manufactured using a heat high pressure system. This procedure ensures high quality, durability, and dimensional stability. Subfloor must be perfectly plane, solid, without cracks, clean and dry before MABOS® is laid. Irregularities and unevenness of the subfloor should not exceed +/- 2 mm every 2 lm. MABOS® can be laid over pre-existing floors such as parquet, ceramic tiles, linoleum, PVC, marble, granite and stone. Always ensure that the old floor covering is securely attached to the subfloor over the whole surface. If MABOS® is to be laid over ceramic or marble tiles, make sure that any unevenness, irregularities and/or joints are filled and leveled. If MABOS® is to be laid over felt or carpet, check the step firmness of the coating before laying. It is however advisable to remove this type of soft floor covering for hygienic reasons. Before laying, planks and tiles should be left at least 48/72 hours inside the premises where they are to be laid. The area should be appropriately acclimatized in advance. The ideal laying temperature is between 18º and 25ºC (64.4 – 77ºF) and the floor should be about 15ºC (59ºF). These climate conditions should be held 3 days before and up to 7 days after installation. Store the boxes as to allow the material to remain in the recommended ideal temperature. Always make sure that the MABOS® boxes are positioned on a flat surface during the acclimatization phase, to keep planks and tiles in their original shape and prevent their content from twisting. Place the metal foil onto the previously cleaned subfloor with the shiny side down. Place a foil next to the other, for the subfloor total surface to be covered. The distance between the foils should not exceed 3/4 mm. and the edges should never overlap. Lay out the metal foil perpendicular (90º rotated) to the direction that has been chosen for laying the flooring. Once you are finished with the installation of the metal foils, you can start laying down the chosen MABOS® planks/tiles by simply placing them on the metal foils. It is advisable to leave a gap of approx. 4-5 mm against walls. 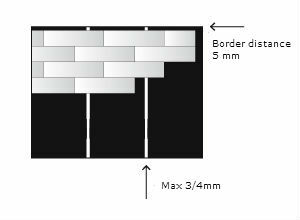 Using dilatation profile should be considered when laying MABOS® in a room with a large surface. In order to adjust a single plank/tile, carve the surface with a carpet cutter, fold it and trim it afterwards with a hook knife. Direct sunlight (infrared beams) may cause MABOS® (and all PVC floorings) to expand and/or twist. This can be avoided by using simple solutions such as external or internal blinds, or more sophisticated alternatives such as “reactive” glass or the application of special films to windows which allow a reduction of up to 98% of infra-red rays, also offering significant energy savings. Once laid and therefore joined to the metal foil, the MABOS® magnetic flooring system forms a closed magnetic field and maintains its physical characteristics unaltered over time. For this reason the magnetic properties of MABOS® can be considered permanent. The MABOS® magnetic system does not affect the conditions of the environment where the flooring is installed. Measurements of the magnetic field carried out using a “TESLA METER TM 7801” apparatus did not show variations following the installation of MABOS®. MABOS® system can be installed in all types of environment, without exception. Laying over underfloor heating system. In the case of laying over underfloor heating, this should be switched on beforehand, following the procedures and checks required by the relevant European standards. Ensure that the temperature of the sub-floor and/or flooring does not exceed 27ºC (80.6ºF) once the heating unit is in function, and that the heating itself does not exceed approximately 34ºC (please see DIN 4725 “heat lines”). The MABOS® flooring system requires little maintenance, however there are some simple rules are recommended. The most important is to have a doormat or grate at the entrance, to stop dirt being brought inside. This helps a great deal in keeping maintenance costs low and increases the durability of the floor. It is also important to place pads beneath the feet of furniture, tables and, chairs. Solvent based polish or glazed varnishes; acetone or any type of solvent have to be avoided. Use a vacuum cleaner or broom or an electrostatic cloth to remove dust and dirt from the flooring. Wash the floor; for full cleaning and sanitation of MABOS® flooring, use an appropriate detergent diluted in water and applied with a damp cloth or micro-fibre mop. We recommend the use of Emu-SF, a detergent specifically created for cleaning PVC flooring. Allow the flooring to dry before opening the area for use. EMU-SF is an excellent detergent for professional use; it reduces the build-up of dirt by forming a protective film which gives MABOS® a natural sheen. Dilution: for ordinary cleaning, dilute approx. 50ml of Emu-SF per litre of water. For very dirty floors increase the dose up to approx. 150ml per litre of water. If floor-washing machines are used, we recommend low velocity cleaners. PVC (polyvinyl chloride), often called vinyl, is a thermoplastic material. A significant part of its mass is composed of chloride. Thermoplastic materials can be repeatedly melted down: after heating to a certain temperature and moulded, they will cool down and solidify in new shapes. PVC is used to manufacture long lasting goods, which can be recycled again and again following their use. This reduces waste and the use of new raw materials. PVC products are 100% recyclable, physically and chemically. It is also energy effective. After mechanical separation, grinding, washing, and treatment to remove impurities, the PVC can be reworked with various techniques (granulation or powdering) and reused for the production of new goods.